As a specialist university, it holds a unique place within the country; its prominent role is demonstrated by the fact that approximately 42 percent of Hungary’s doctors, 70 percent of its dentists, 50 percent of its pharmacists and 27 percent of its health care professionals are Semmelweis graduates. A truly international community, programmes are offered in three languages (Hungarian, English, German), and foreign students account for nearly a third of the around 11,000 students studying at the University’s six faculties. In addition to teaching, Semmelweis University is the largest provider of health care services in Hungary. Even though practical teaching takes place at the university’s clinics and hospitals, they provide the highest quality patient care services at the same time. Most of the departments cater for the most serious cases and patients requiring complex treatment, thus making the university a national health care provider. Research, development, and innovation comprise an important part of the University’s three-fold mission. The target of research at the university are early diagnostics and therapy, disease prevention and active ageing. Currently, there are 300 research groups at the university including 31 international and 94 Hungarian research grants. Many of its professors are members of the Hungarian Academy of Sciences, with close collaboration between the two institutions in numerous areas. Semmelweis University received the prestigious Research University title for the second time in 2013. 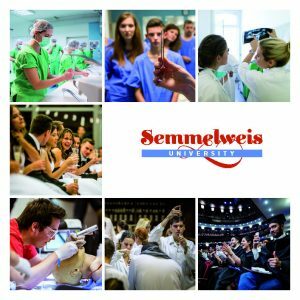 Semmelweis University is an employer of nearly 8,500 employees and is involved in higher education vocational training, specialist postgraduate training, higher education vocational training, the cultivation of the next generation of scientists, and nurturing talent. The University organises international conferences and is represented on numerous international scientific boards. Its academic reputation is well-regarded around the world.